Dayton Dragons third baseman Taylor Sparks and Beloit Snappers LHP Zack Erwin respectively were named the Midwest League offensive player and pitcher of the week for the period of Aug. 21-27. Sparks played in six games during that period, batting .333 (9-for-27) with three homers, two doubles, one walk, eight runs batted in, and four runs scored. In 27 games with the Dragons this season, the Cincinnati Reds prospect is batting .212 with 4 HR and 16 RBI. This is the third time Erwin was named the Midwest League’s pitcher of the week this season, also earning the honor for the periods of June 12-18 and July 10-16. Overall this season, the Oakland A’s prospect is 6-4 with a 2.22 ERA, 86 strikeouts and 28 walks in 89.1 innings (18 starts) for the Snappers. 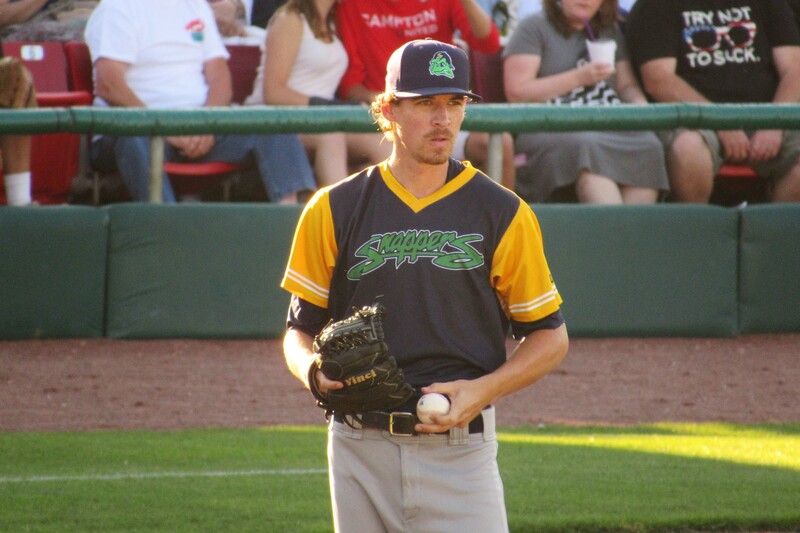 Erwin’s first start after being named the Midwest League pitcher of the week came in the second game of Monday’s doubleheader between the Snappers and the Burlington Bees. He gave up two runs on two hits, seven walks and a wild pitch in 4.1 innings. The Snappers, however, managed to complete a sweep of the doubleheader, winning the first game 5-4 and the second game 8-4. That keeps them alive in the Western Division’s second-half wild-card race, trailing the Peoria Chiefs by 3.5 games with six games left in the season. The Clinton LumberKings are four games behind the Chiefs, and the Wisconsin Timber Rattlers are five behind the pace. Peoria’s magic number is three. The River Bandits clinched the second-half Western Division title over the weekend, joining the Kane County Cougars (first-half division title) and the Cedar Rapids Kernels (first-half wild-card) as playoff teams from the Western Division this year. The race is tighter in the Eastern Division. The Fort Wayne TinCaps have a three-game lead over the Hot Rods for a playoff spot, with the South Bend Cubs only a game behind Bowling Green. The Hot Rods are 1-9 in their last 10 games, while the Cubs are 9-1 during that stretch. The West Michigan Whitecaps (first-half division title) and the Dayton Dragons (first-half wild-card) won Eastern Division playoff spots in the first half. The Whitecaps have the Midwest League’s best overall record this season (87-43). The River Bandits are second with a 78-54 record. This entry was posted in 2017 Playoffs, Beloit Snappers, Bowling Green Hot Rods, Burlington Bees, Cedar Rapids Kernels, Clinton LumberKings, Dayton Dragons, Fort Wayne TinCaps, Kane County Cougars, Midwest League, Peoria Chiefs, Quad Cities River Bandits, South Bend Silver Hawks, West Michigan Whitecaps, Wisconsin Timber Rattlers. Bookmark the permalink.